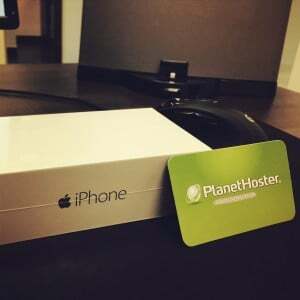 In order to offer the best to its customers, PlanetHoster gives you the chance to win some nice gifts. Back to school comes with surprises and PlaneHoster is not far behind. Indeed, in early October we will renew and adapt our services to offer servers with even higher quality and more efficiency to meet the demands of our loyal customers. — First prize: an iPhone 6 last generation. — Second prize: a hybrid or FR-CA Unlimited hosting for a period of one year. — Third prize: a free domain name for life. 1. Be a customer and have Emails Hosting, Hybrid or higher. 3. Subscribe to our Facebook and/or Twitter page. 4. Post a comment with the link to the tweet / Facebook status on this blog and explain why you like PlanetHoster. The only thing left to do is to wait for the draw of the random.org god. The winners will be announced Friday, October 17, 2014, so do not miss your chance! NOTICE to all! In order to give the chance to the last stragglers, we are extending the possibilities to earn, up to Monday, October 20 8pm of France. PS: Customers who have not yet met the requirements of the contest and who still want to participate can be requested via this link. Thank you for participating in our PlanetHoster contest! The lucky winners will be contacted within 24 hours by email personally. Thank you to the many for playing.